I am one of the people who are in the town city center at ten am Boxing Day morning looking for a bargain, not to the extreme, but it's become a tradition within our family to go on a little shopping trip. I've waited a while to post this because on Boxing Day I was extremely disappointed with the sales and didn't pick a lot up, however, throughout the months I have slowly been picking up a few sales items that have been left dotted around. Here's what I picked up.. I picked up heart shift dress from Ark. It cost me £10 in the sale down from £22.99. I love this dress and have been wearing it an awful lot. The problem with shift dresses that sometimes I think they can look unflattering on my body shape, however, I really like the way this ones fits and I find it suits my body shape well. I love the pattern as well and think the little white hearts are adorable. This dress is available online, however, it does not seem to be in the sale. I bought this floral New Look dress for £11.50, but I am not aware of the original price and can't find the dress anywhere online. For some reason I am always drawn to dresses, tops or jumpers etc, with cut out sleeves and this is the original reason I bought this dress. There were many dotted around without the cut out sleeve detailing, however, I went for this one. I am a big lover of floral patters and have so many items of clothing with florals on, however, I don't like them being too bright, therefore, I love the colours and the subtle floral patters in this dress. Another New Look item I bought is this floral jumper. I normally don't shop in New Look but the sale was amazing after Christmas and it ended up being the shop where I bought the most things. I bought this jumper for £10 and is made out of the softest material. New Look again! I picked this up very last minute in New Look, whilst I was in the que and I didn't have a chance to try it on. It's a black quilted faux leather skirt and cost me £8. I picked up my usual size but it's a little bit too big for me which I was a bit disappointed by, but I still love it. The last New Look item here and another skirt. I have been after a denim skirt for absolutely ages but I have never found one I really liked. When I saw this denim skirt in the sale for £5 I had to have it. It was an absolute bargain. It's not completely denim and is quite thin and stretchy material, but I do like how it fits. 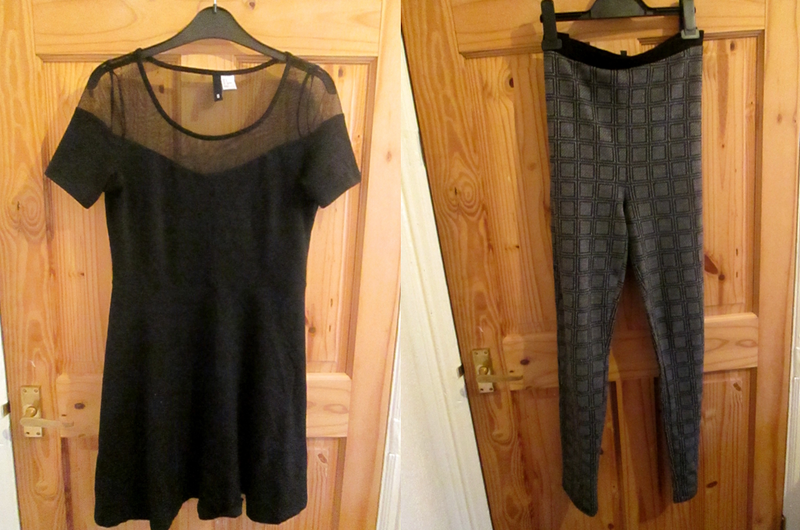 These last two are my favouite sale buys. This first one being this H&M black dress. It's off the shoulder skater dress but has mesh style panel at the top and it cost me £7. I actually wore this for New Years Eve with bright red lipstick and a red bag. I own a lot of black dresses but I absolutely love the way this one fits and the unique top which takes it away from being a normal black skater dress. I was absolutely ecstatic when I saw these Topshop printed leggings in the sale that I bought them two sizes too big, oops. I tried them on in my size a few weeks before Christmas, however, they were super tight, therefore when I saw these for £15 in the sale and a couple of sizes bigger I had to have them. They are a little too big for me now but there are still wearable. How was your sale shopping? Did you pick up any of these items?